There are producers who manage to make wines that can be approached on an undemanding casual way, but still has a depth and complexity that so that each time you put your nose to the glass, or lip to rim, you discover something new. Agathe Bursine is such a producer. All wines from her extremely well-run small property are fresh, clean and fruity. Prices are very moderate, in fact too low according to all objective standards. 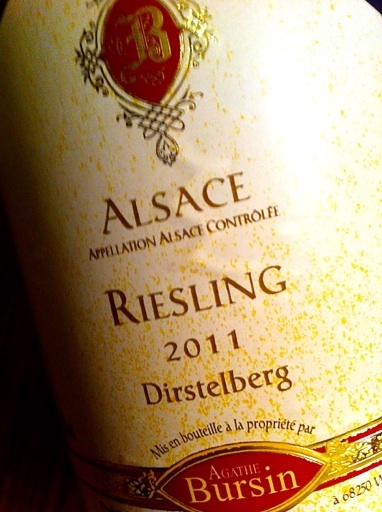 2011 Riesling Dirstelberg from Agathe Bursin in Westhalten has aromas of passion fruit fruit, lemons, ripe green apples and wet stones. The taste is medium bodied and harmonious with fresh acidity, lots of juicy fruit, a balance on the dry side and a wonderfully tight minerality that stays long in the mouth. 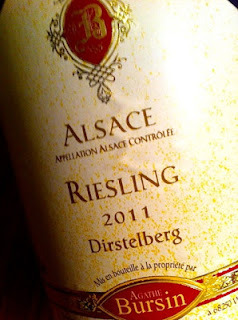 This is how Riesling should taste! Price: €8.60.